The Vilenica jury consisting of Andrej Blatnik (president), Lidija Dimkovska (vice president), Ludwig Hartinger, Vesna Kondrič Horvat, Tone Peršak, Jutka Rudaš, Veronika Simoniti, Namita Subiotto, Špela Šramel, Aleš Šteger, Veno Taufer, and Jana Unuk awards the 2015 Vilenica International Literary Prize to Jáchym Topol. Jachým Topol (1962) is a poet, prose writer, and journalist. He was born on 4 August 1962 in Prague, then the capital city of Czechoslovakia. He is the son of poet and playwright Josef Topol, brother of musician Filip Topol, and grandson of writer Karel Schulz. Until 1986 he – like older dissidents who were cast to the margins of society – was forced to work as a stocker and stoker, and was finally granted disability retirement after the faithful year of 1989. He signed the “Charta 77” (Charter 77) and was politically active as a member of the group České dětí (Czech children). In 1988 he was imprisoned for a short period of time for illegally crossing the border to Poland and for spreading prohibited anti-socialist propaganda materials. He studied Ethnology at the Faculty of Arts for a couple of years. He has been working as a freelance writer since 1991. During the period of the “underground,” he was active as the co-publisher ofRevolver Revue magazine, of which he was the editor-in-chief until 1993. He also worked on the respective editorial boards of the Respekt weekly and the Lidové noviny newspaper. 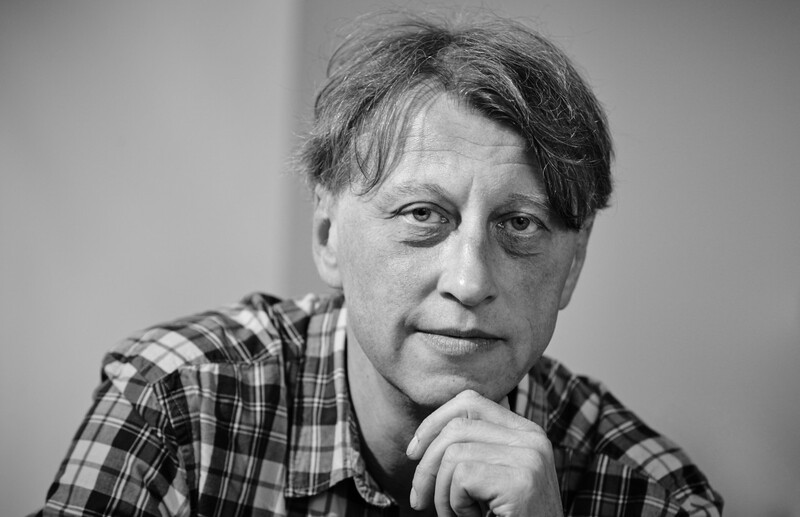 He is the current programme director of the Václav Havel Library. […] Over his three decades of writing literature, Jachým Topol has moulded himself into a renowned Czech prose writer and achieved international acclaim. His works have been translated into many languages, among them English, German, and Polish. He has proven to be a master of language, an apt storyteller with a rich imagination. He is a skilled craftsman of both extensive narrative texts as well as shorter literary forms. As a prose writer he swaps between narrative strategies to shape recognisable poetics. His prose moves between document and fiction. Historical memory plays a prominent role in his works. Within the memory of space, the author awakens the pain and the injustice perpetrated by the recently extinguished socialist era. His prose is existential, containing a moral charge: his characters, more or less lost, travel through the “maze of the world and almost never reach the Eden of the heart.” Often they are even incapable of recognising the good inside the ruling evil, although they constantly try to “protect the orphans and the widows” and thus find the moral equilibrium in a chaotic world. His main characters originate from a marginal world. They are boys, young intellectuals, lumpenproletarians, criminals, and junkies. His prose is frequently about Prague as a synonym for the crossroads of historical events, as an intersection of national civilisations, as a mythical city full of cultures and symbolic codes. Colloquial language is his most typical means of expression. He uses it to form dialogues and enriches it with images of a new fictitious reality. He is a modern author who refers to both the Czech and the European tradition in his intertextual communication with other authors, an author who formidably places himself among the distinguished authors of the Central European realm. Like Hašek, Kafka, and Hrabal, Jachým Topol has forever left a mark in the literary life of this particular space.